I do understand that the soldiers are not willing to put volunteers’ lives at risk. They explain in plain language what they think our skulls contain instead of brains, then they turn away. But among them, different people can be found. Our caravan consisting of two large vans stuffed with groceries was eventually let through and escorted to our destination. 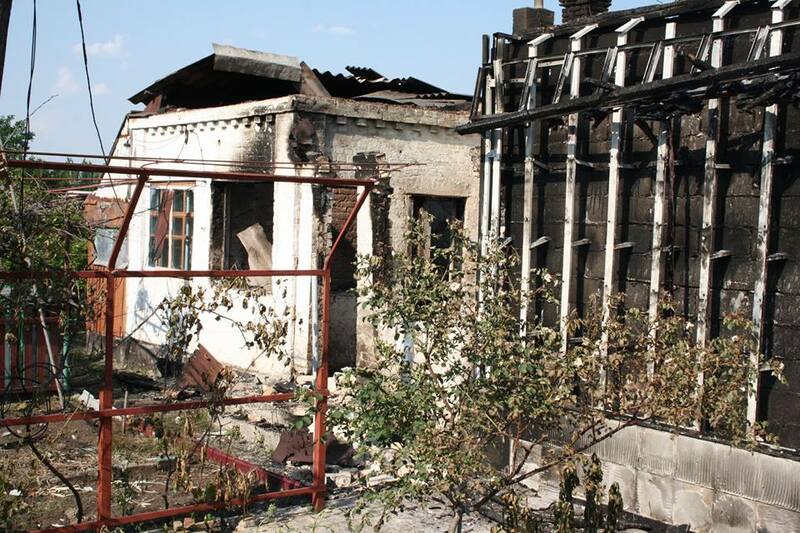 We had to use different roads from those we were used to from our previous travels: it’s impossible to drive through Maryinka right now, having just recently been a witness to fierce battles. We had to pick our way through a different route…Fragments of broken asphalt…Unpaved gravel… Narrow country roads, known only to the locals… A few times we had to stop to make sure we hadn’t lost our way. Reeds, nearly dry ponds…. Deserted houses on the outskirts…. Then here it is, the town which humanitarian “Emmanuel” Association representatives visit a few times each month for the past year or so. The war gave us many friends here, who are now closer than a brother…. We are very eager to see them… To see them alive…. It will take more than one day for them to tell it all. It will take years. They will see it in many nightmares, waking them from their sleep….Who can possibly forget such terror, such horror!? But now we must unload our vans, distribute the groceries, as the soldiers are hurrying us up. 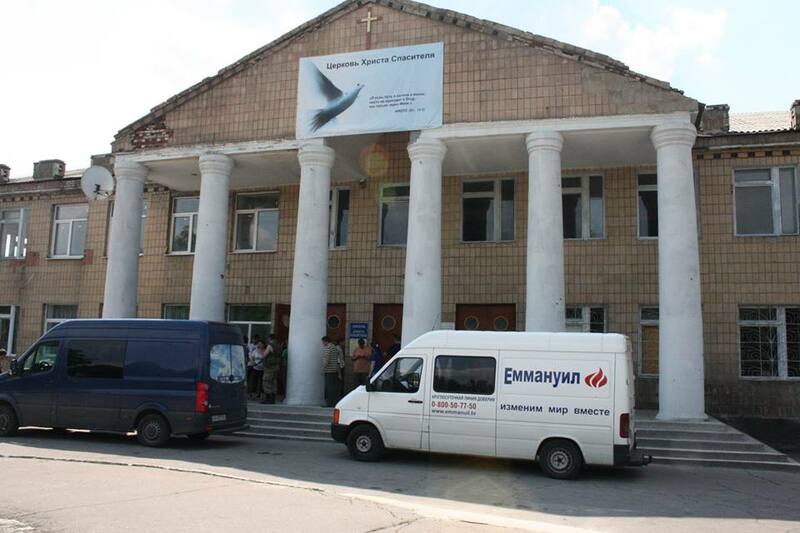 We arrive at the deserted store that has long become a distribution center for Christian humanitarian aid. It is highly unusual to see no one waiting. We were used to being greeted by hundreds here. We hope that bread will be distributed later by our local contacts so we start unloading… But then… we see two men here… an elderly gentleman hurrying through a small park…over by the road someone slammed on the brakes to see what’s going on… All of a sudden people started appearing out of nowhere… Some women showed up and immediately burst into tears. 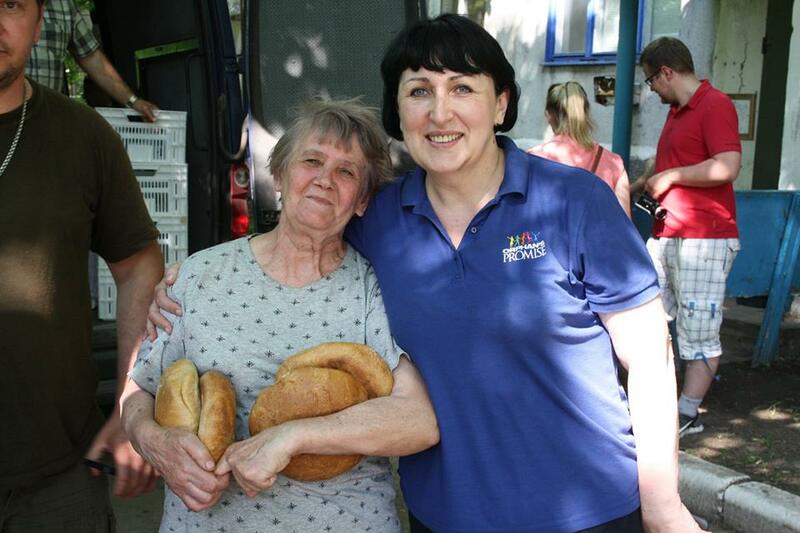 Firmly, Halyna tells us we are to stop unloading, that we will distribute the bread right out in the streets. 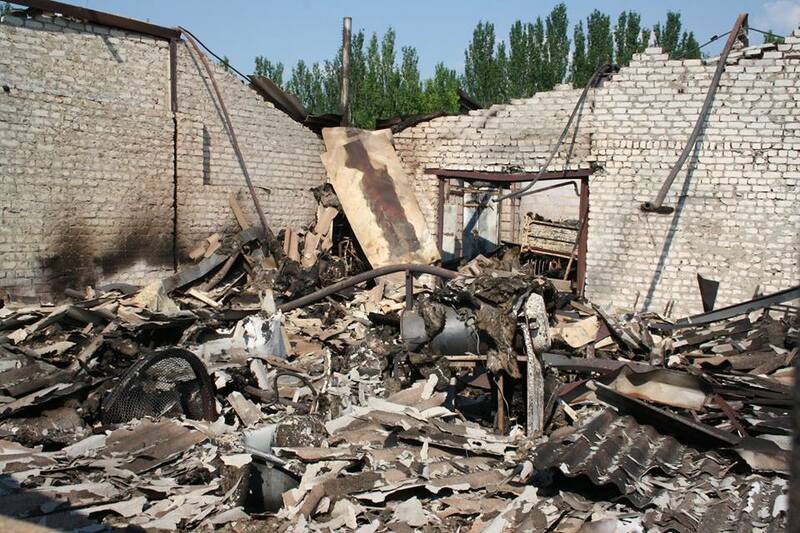 She tells us to go to the areas most harmed by the shelling. To walk along the highrise buildings, to call out, distribute bread, talk to the people, hug them, hold them…. 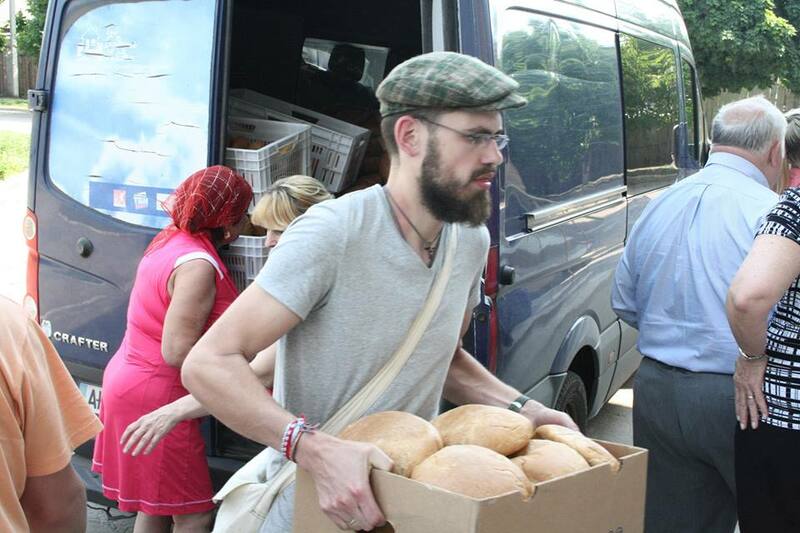 A week ago, we would have distributed 1,500 loaves of bread in a matter of half an hour. This time, it took several hours. Several hours I don’t care to remember, several hours I will never forget….Elderly… women… children…A funeral procession leaving the cemetery having buried a man killed by fragments just yesterday… Burned out homes…Smoke still rising from the ashes…Charred chimneys standing as the only reminder of the roof that was still there yesterday…. 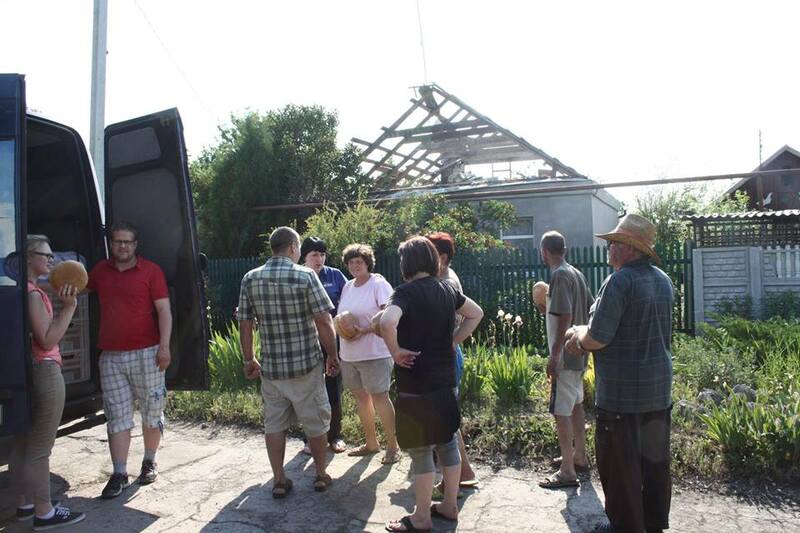 A man pushing a wheelbarrow with chunks of concrete that used to be his home…A three-legged dog… Auntie Vera, whose memories of losing her son to a similar shelling last year, right here in Krasnohorivka, his life ended by shrapnel, were triggered and stirred by the recent shelling… We were walking the streets surrounded by big fluffy white blooms of elderberries. Do you know what they smell like? Lean down, smell them. Maybe your elderberries have a strong sweet aroma. In Krasnohorivka, elderberry blooms smell like…. ashes…. Do not let yourself forget about this. And do not grow weary of praying that this war will finally come to an end. This entry was posted in English, English News, Eyewitness stories, Pictures, War in Donbas and tagged #FreeSavchenko, #freesentsov, #RussiaInvadedUkraine, #StopRussianAggression, #UkraineUnderAttack, Donbas, Donetsk Oblast, Human Rights, Krasnohorivka, Ukraine. Bookmark the permalink.